I’ll admit I was skeptical at first. I’d never really liked tacos made with soft corn tortillas. It was the white flour type or the fried ones I’d been used to. 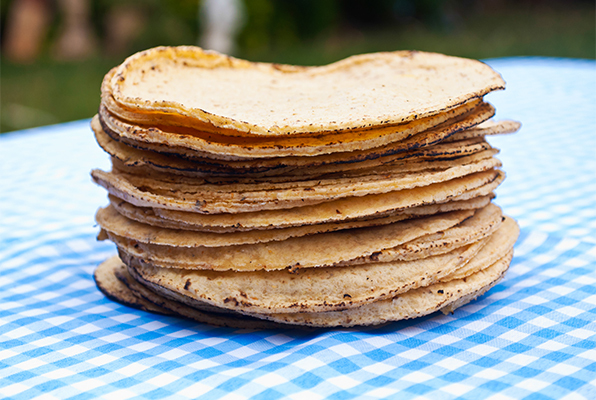 But then my husband found the simplest recipe for homemade corn tortillas, and I was hooked! These tortillas are not only simple, but very healthy. They’ve got just 3 ingredients and are gluten and preservative-free. They can be used for tacos, enchiladas or by themselves with salsa or guacamole. Try them at your next football party. Your guests will gobble them up! Place corn masa in a bowl and add salt and warm water. Mix until dough forms a soft ball. It will be playdough consistency. Roll dough into eight, 1″ balls. Cut a gallon-sized plastic bag in half. Place 1 ball of dough inside the bag and using a pie plate or tortilla press, press the dough into a flat tortilla. Heat a large skillet and spray with non-stick cooking spray. Place the tortilla in the skillet for ~1 minute, then flip and cook the other side. Place on a plate and cover with a clean towel to steam them a bit before serving. Makes 8 small tortillas. Nutrition information per serving: 53 calories, .6 gm fat, 11 gm carbohydrate, 1 gm protein, 1.1 fiber, 0 mg cholesterol, 37 mg sodium.